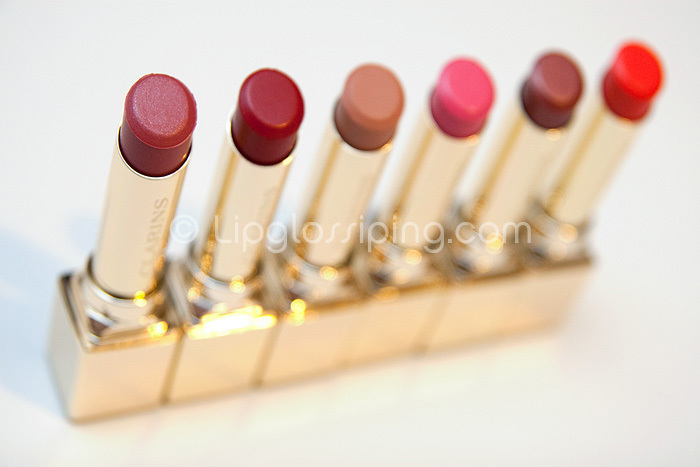 It’s all about the lips this Autumn as far as Clarins are concerned. Shades and swatches after the jump! The texture on these is quite unusual. I find them to be a odd cross between a lipstick and a gloss. They have that tacky feeling but without the gloopiness or thickness that you’d associate with a gloss. It’s a novel take on the long-lasting formula which usually dries my lips to the point of being uncomfortable in less than an hour. These don’t do that. Pigmentation varies from shade to shade, some are fully opaque with one swipe… whilst others take a few coats before reaching a smooth finish. They drag a touch on the lips, so patchiness can be an issue if you’re not careful when applying. 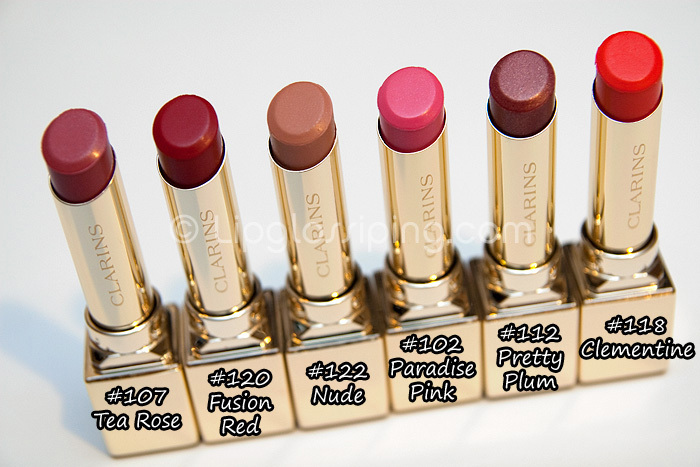 Final Verdict – The new Rouge Prodiges lipsticks from Clarins are a great choice if you normally suffer from dryness with long-lasting lipstick formulas. Be aware that these do feel sticky on the lips and can look patchy unless you are happy to apply a few coats. (You can see evidence of a patchy application in my lip swatch of Pretty Plum). 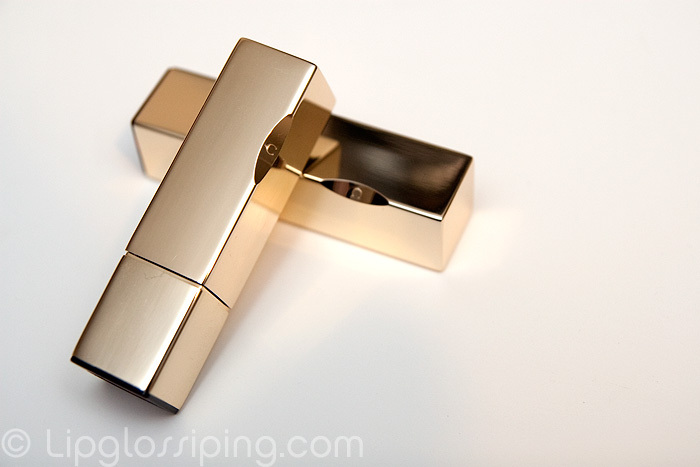 Once applied, the colours are true and vibrant, the finish glossy and forgiving of fine lines. With a little care during application, these are probably the nicest long-lasting formula I’ve tried. 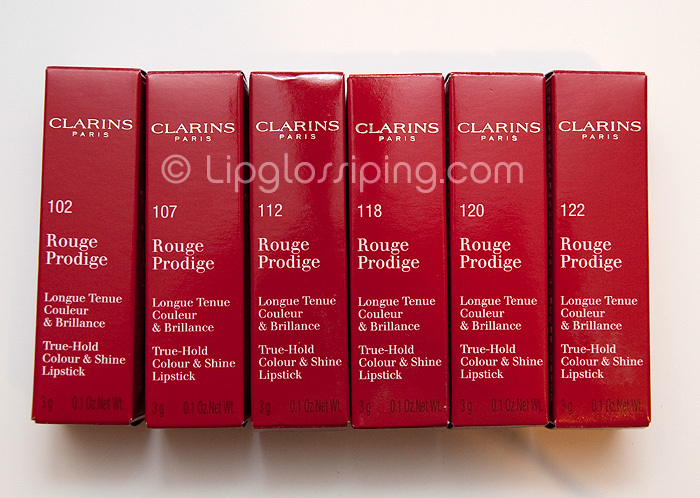 Clarins Rouge Prodiges are priced at £16 each and available on counter or online. Tea Rose is so lovely!! They all look really gorgeous on you! I might have to try these, have never used Clarins makeup before!!! Always a first time for everything! I’m not convinced by these. Tea Rose looks nice BUT I think some of them look a bit patchy on your lips. I think I’ll stay away but the swatches are appreciated, you know this! I am loooving tea rose on you! Thanks for the swatches. Paradise Pink and Tea Rose look beautiful! 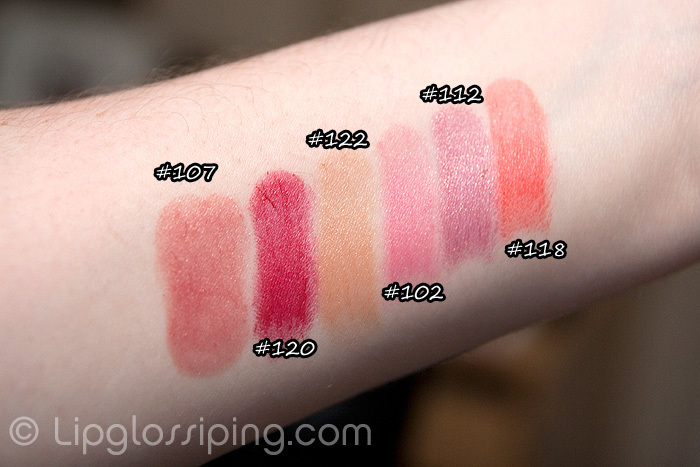 Tea Rose is a beauty, but it looks far too similar to ELF’s Runway Pink lipstick for me to justify… well I might go swatch it and compare… I’m a sucker for dusky pinks. *oohs and ahhs* :p I am majorly loving that packaging! Tea Rose I must check out! It looks so lovely on you! I love Pretty Plum and Tea Rose!